Clear cell renal cell carcinoma (CCRCC) is a renal cortical tumor typically characterized by malignant epithelial cells with clear cytoplasm and a compact-alveolar (nested) or acinar growth pattern interspersed with intricate, arborizing vasculature. A variable proportion of cells with granular eosinophilic cytoplasm may be present. See the image below. Typical gross presentation of clear cell renal cell carcinoma (lower left) with golden color due to intracellular lipid accumulation. White areas are foci of sarcomatoid differentiation. Note tumor extension along the renal vein. Tumors in which eosinophilic cells predominate were previously classified as "granular cell" carcinoma but are currently included among CCRCCs in the 2004 World Health Organization classification of renal tumors based on the presence of vasculature and genetic alterations typical of CCRCC. The inclusion of tumors with granular cells prompted some classifications to adopt the terminology "conventional" rather than "clear cell" renal cell carcinoma (RCC); however, current classifications have reverted to CCRCC. CCRCC is characterized genetically by alterations to chromosome 3p. Go to Renal Cell Carcinoma and Sarcomatoid and Rhabdoid Renal Cell Carcinoma for more complete information on these topics. The incidence of renal cell carcinoma (RCC) has been rising steadily in Europe and the United States for the past 3 decades, with a particular rise in the proportion of small, asymptomatic tumors detected incidentally via abdominal imaging. Go to Imaging of Renal Cell Carcinoma for more complete information on this topic. Clear cell renal cell carcinoma (CCRCC) is typically a solitary tumor, with multifocality and bilaterality only occurring in 2-7% and 1-2% of sporadic cases, respectively. [8, 39, 40] Tumor sizes in contemporary series range from 0.3-30 cm in maximal diameter, with a mean of 6-7 cm, [5, 8] although current trends are toward smaller tumors. The tumor commonly presents as a bosselated, well-circumscribed mass with a capsule or pseudocapsule and a pushing margin. Occasionally, an infiltrative margin is seen. On cut section, CCRCC is typically a golden color because of the accumulation of lipid in the malignant cells, while areas of hemorrhage (brown), fibrosis (gray), necrosis, and cystic degeneration often give a variegated appearance. See the images below. Clear cell renal cell carcinoma (upper right) on gross examination, with extensive dark areas indicating hemorrhage. Note extension through the capsule into the perinephric fat along a pushing, expansile margin (top). Typically, clear cell renal cell carcinoma (CCRCC) is characterized by epithelial cells with clear cytoplasm and a well-defined cell membrane, interspersed within a highly vascularized stroma. The transparency of the cytoplasm results from accumulated droplets of glycogen, phospholipids, and neutral lipids-in particular, cholesterol ester. [42, 43] Glycogen can be demonstrated by periodic-acid Schiff (PAS) stain, whereas neutral lipids can be identified using the Oil red O stain on unfixed tissue but are dissolved by histological processing. CCRCC may also contain a variable proportion of cells with granular eosinophilic cytoplasm. Rarely, these granular cells are the predominant or even the only cell type. See the images below. Typical histologic appearance of clear cell renal cell carcinoma on hematoxylin and eosin stain, showing nests of epithelial cells with clear cytoplasm and a distinct cell membrane, separated by a delicate branching network of vascular tissue. Granular cell variant of clear cell renal cell carcinoma on hematoxylin and eosin stain. 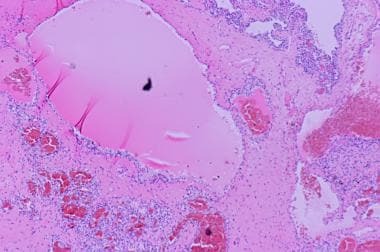 Histologic coagulative necrosis occurs in 28-37% of CCRCCs, most commonly in those with high nuclear grade. [39, 46, 47] Other variations associated with a high grade include cells with sarcomatoid or rhabdoid differentiation. Sarcomatoid differentiation is seen in 5-25% of CCRCCs and is identified as focal to extensive regions of malignant spindled cells growing as whorled or intersecting fascicles, or in a storiform pattern. Rhabdoid differentiation occurs in 3-5% of RCCs, most commonly in CCRCC, and is identified as focal to extensive regions of large, high-grade malignant cells with abundant eosinophilic cytoplasm, irregular eccentric nuclei, and large globular eosinophilic intracytoplasmic inclusions that stain strongly for vimentin. [51, 52, 53, 54] Occasionally, both forms of differentiation may coexist within a tumor. CCRCC may grow in various architectural patterns, with the most common types being compact-alveolar (nested), tubular (acinar), and microcystic. In the compact-alveolar or nested pattern, solid rounded nests of epithelial cells are separated by a delicate branching network of connective tissue that is highly vascularized with thin walled blood vessels, resulting in a sinusoidal appearance. See the images below. Immunohistochemistry with anti-CD31 antibody highlights the extensive vasculature of clear cell renal cell carcinoma. In the tubular or acinar pattern, epithelial cells line the septa of vascularized connective tissue and form central lumens. In regions of cystic degeneration, these structures dilate to form a microcystic and/or macrocystic pattern with luminal spaces containing necrotic material, pale eosinophilic fluid, and red blood cells. [41, 55] CCRCCs often contain more than one architectural pattern, and focal regions of papillary or pseudopapillary architecture may also occur. See the images below. Microcystic architecture in clear cell renal cell carcinoma showing dilated luminal spaces containing necrotic material, pale eosinophilic fluid and red blood cells. A region of clear cell renal cell carcinoma with pseudopapillary architecture. A rare variant of clear cell renal cell carcinoma with prolific metaplastic smooth muscle stroma. The spindle cells show evidence of smooth muscle differentiation and, in some cases, merge with the walls of blood vessels, suggestive of vascular proliferation in response to angiogenic factors produced by the tumor. Genetic analysis has demonstrated loss of chromosome 3 or 3p in all 3 cases analyzed,  supporting the authors' proposed classification as a variant of CCRCC. Ultrastructurally, CCRCC shows tubular differentiation, with tumor cells clustered around microlumens and separated from the stroma by a well-defined basal lamina. Distinctive features include long microvilli typical of the brush border seen in renal proximal tubules and abundant lipid vacuoles and glycogen deposits. CCRCC tends to express the low molecular weight cytokeratins (CK) characteristic of simple epithelia (CK7, 8, 18, and 19), in particular, the CK expressed most strongly by epithelial cells of the proximal convoluted tubules (CK8 and 18). Between 94-100% of CCRCCs stain positively with antibodies against CK18, while 14-40% are positive for CK8. Immunostains for AMACR and CK7 are considered most useful for distinguishing CCRCC from papillary RCC, whereas vimentin, CK7, CD117, E-cadherin, and parvalbumin are considered most useful for distinguishing CCRCC from chromophobe RCC and oncocytoma. [75, 76] Recent evidence suggests that immunostaining for the calcium-binding protein secretagogin may also prove useful for distinguishing CCRCC from other RCC subtypes, with positive staining observed in 35/94 (37%) of CCRCCs but in none of 37 papillary RCC, 24 chromophobe RCC, or 30 oncocytomas. This preliminary evidence also suggested an association between strong expression of secretagogin and a higher metastasis rate in CRCC; however, the numbers analyzed were small, and confirmation in a larger study is required. 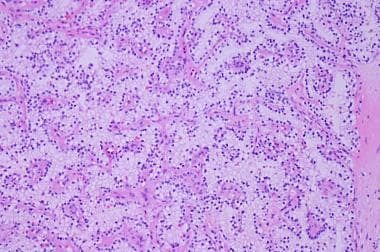 Distinguishing between unusual variants of the common RCC histologic types and other types of tumors can be difficult. For example, CCRCCs composed predominantly of granular eosinophilic cells may show a morphological resemblance to the eosinophilic variant of chromophobe RCC (chRCC) or to oncocytoma. Immunohistochemical markers suggested for this distinction include E-cadherin, CD117/KIT, or parvalbumin, which are rarely expressed in CCRCC. Rare tumors composed mainly of clear cells but with a predominant papillary architecture tend to be classified as papillary RCC with extensive clear cell change. However, genetic analysis has, in some cases, found specific translocations characteristic of Xp11 translocation RCC, a tumor with clear and/or eosinophilic cells that can show both papillary architecture and a nested pattern with vascular stroma similar to compact-alveolar (nested) CCRCC. RCC with predominantly papillary architecture but extensive clear cell cytology can be characterized using both genetic analysis (chromosomes 3p, 7, 17, and Y) and immunostaining (AMACR, CK7, TFE3). In a study of 14 such cases,  the immunostaining and genetic profiles correlated well, and this approach allowed classification of 9 tumors as papillary RCC and 3 as CCRCCs, leaving only 2 cases as unclassified RCC. A less common pathway followed in 18% of CCRCCs mainly involves gains of entire chromosomes resulting in a hyperdiploid karyotype. Common gains involve chromosomes 7 (18-30%), 16 (11%), 20 (10%), 12 (10-15%), and 2 (9-14%). This second pathway is similar to the genetic events seen in papillary RCC, except that most (67%) papillary RCCs also show gain of chromosome 17. Clear cell renal cell carcinoma (CCRCC) is currently staged according to the 2002 version of the American Joint Committee on Cancer's TNM (tumor-node-metastasis) staging system for renal tumors. Most criteria of this revised system reflect the pattern of spread common in CCRCC. Clear cell renal cell carcinoma showing extensive necrosis following treatment with the antiangiogenic agent sunitinib. How is clear cell renal cell carcinoma (CCRCC) characterized? What is the prevalence of cell renal cell carcinoma (CCRCC)? Which factors increase the risk for clear cell renal cell carcinoma (CCRCC)? What is the role of genetics in the etiology of clear cell renal cell carcinoma (CCRCC)? What is the pathophysiology of clear cell renal cell carcinoma (CCRCC)? How does clear cell renal cell carcinoma (CCRCC) spread? What are the most common sites of clear cell renal cell carcinoma (CCRCC) metastasis? What are the signs and symptoms of clear cell renal cell carcinoma (CCRCC)? 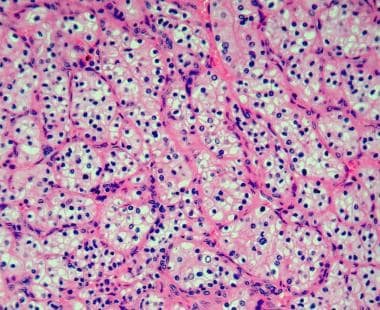 Which conditions are included in the differential diagnoses of clear cell renal cell carcinoma (CCRCC)? What is the role of biopsy in the preoperative assessment of clear cell renal cell carcinoma (CCRCC)? What is the role of imaging studies in the workup of clear cell renal cell carcinoma (CCRCC)? Which gross pathologic findings are characteristic of clear cell renal cell carcinoma (CCRCC)? Which microscopic pathologic findings are characteristic of clear cell renal cell carcinoma (CCRCC)? How is clear cell renal cell carcinoma (CCRCC) graded based on nuclear characteristics? What are the characteristics of rhabdoid differentiation in clear cell renal cell carcinoma (CCRCC)? What are the microscopic architectural growth pattern findings characteristic of clear cell renal cell carcinoma (CCRCC)? What are the ultrastructural microscopic findings characteristic of clear cell renal cell carcinoma (CCRCC)? 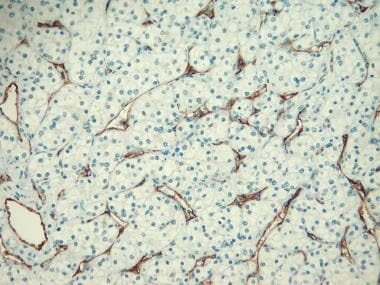 How are typical clear cell renal cell carcinomas (CCRCCs) characterized on immunohistochemical stains? How are atypical clear cell renal cell carcinoma (CCRCC) variants characterized on immunohistochemical stains? 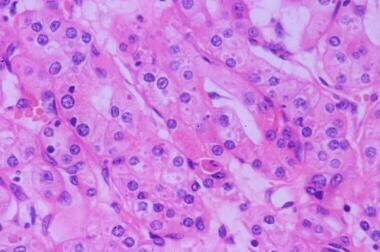 Which molecular and genetic findings are characteristic of clear cell renal cell carcinoma (CCRCC)? How is clear cell renal cell carcinoma (CCRCC) staged? How is clear cell renal cell carcinoma (CCRCC) treated? What is the role of cytokine immunotherapy in the treatment of clear cell renal cell carcinoma (CCRCC)? What is the prognosis of clear cell renal cell carcinoma (CCRCC)? Delahunt B, Eble JN. History of the development of the classification of renal cell neoplasia. Clin Lab Med. 2005 Jun. 25(2):231-46, v. [Medline]. McLaughlin JK, Lipworth L, Tarone RE. Epidemiologic aspects of renal cell carcinoma. Semin Oncol. 2006 Oct. 33(5):527-33. [Medline]. Decastro GJ, McKiernan JM. Epidemiology, clinical staging, and presentation of renal cell carcinoma. Urol Clin North Am. 2008 Nov. 35(4):581-92; vi. [Medline]. Pascual D, Borque A. Epidemiology of kidney cancer. Adv Urol. 2008. 782381. [Medline]. Patard JJ, Leray E, Rioux-Leclercq N, et al. Prognostic value of histologic subtypes in renal cell carcinoma: a multicenter experience. J Clin Oncol. 2005 Apr 20. 23(12):2763-71. [Medline]. Schachter LR, Cookson MS, Chang SS, et al. Second prize: frequency of benign renal cortical tumors and histologic subtypes based on size in a contemporary series: what to tell our patients. J Endourol. 2007 Aug. 21(8):819-23. [Medline]. Cheville JC, Lohse CM, Zincke H, Weaver AL, Blute ML. Comparisons of outcome and prognostic features among histologic subtypes of renal cell carcinoma. Am J Surg Pathol. 2003 May. 27(5):612-24. [Medline]. Gudbjartsson T, Hardarson S, Petursdottir V, Thoroddsen A, Magnusson J, Einarsson GV. Histological subtyping and nuclear grading of renal cell carcinoma and their implications for survival: a retrospective nation-wide study of 629 patients. Eur Urol. 2005 Oct. 48(4):593-600. [Medline]. Taccoen X, Valeri A, Descotes JL, et al. Renal cell carcinoma in adults 40 years old or less: young age is an independent prognostic factor for cancer-specific survival. Eur Urol. 2007 Apr. 51(4):980-7. [Medline]. Bruder E, Passera O, Harms D, et al. Morphologic and molecular characterization of renal cell carcinoma in children and young adults. Am J Surg Pathol. 2004 Sep. 28(9):1117-32. [Medline]. Argani P, Olgac S, Tickoo SK, et al. Xp11 translocation renal cell carcinoma in adults: expanded clinical, pathologic, and genetic spectrum. Am J Surg Pathol. 2007 Aug. 31(8):1149-60. [Medline]. Duchene DA, Lotan Y, Cadeddu JA, Sagalowsky AI, Koeneman KS. Histopathology of surgically managed renal tumors: analysis of a contemporary series. Urology. 2003 Nov. 62(5):827-30. [Medline]. Maher ER. Von Hippel-Lindau disease. Curr Mol Med. 2004 Dec. 4(8):833-42. [Medline]. Bonne AC, Bodmer D, Schoenmakers EF, van Ravenswaaij CM, Hoogerbrugge N, van Kessel AG. Chromosome 3 translocations and familial renal cell cancer. Curr Mol Med. 2004 Dec. 4(8):849-54. [Medline]. Woodward ER. Familial non-syndromic clear cell renal cell carcinoma. Curr Mol Med. 2004 Dec. 4(8):843-8. [Medline]. Henske EP. The genetic basis of kidney cancer: why is tuberous sclerosis complex often overlooked?. Curr Mol Med. 2004 Dec. 4(8):825-31. [Medline]. Schmidt LS. Birt-Hogg-Dube syndrome, a genodermatosis that increases risk for renal carcinoma. Curr Mol Med. 2004 Dec. 4(8):877-85. [Medline]. Wallace AC, Nairn RC. Renal tubular antigens in kidney tumors. Cancer. 1972 Apr. 29(4):977-81. [Medline]. Bonsib SM. The renal sinus is the principal invasive pathway: a prospective study of 100 renal cell carcinomas. Am J Surg Pathol. 2004 Dec. 28(12):1594-600. [Medline]. Bonsib SM. Renal lymphatics, and lymphatic involvement in sinus vein invasive (pT3b) clear cell renal cell carcinoma: a study of 40 cases. Mod Pathol. 2006 May. 19(5):746-53. [Medline]. Mai KT, Landry DC, Robertson SJ, et al. A comparative study of metastatic renal cell carcinoma with correlation to subtype and primary tumor. Pathol Res Pract. 2001. 197(10):671-5. [Medline]. Cho HJ, Kim SJ, Ha US, et al. Prognostic value of capsular invasion for localized clear-cell renal cell carcinoma. Eur Urol. 2009 Dec. 56(6):1006-12. [Medline]. Waldert M, Haitel A, Marberger M, et al. Comparison of type I and II papillary renal cell carcinoma (RCC) and clear cell RCC. BJU Int. 2008 Nov. 102(10):1381-4. [Medline]. Margulis V, Tamboli P, Matin SF, Swanson DA, Wood CG. Analysis of clinicopathologic predictors of oncologic outcome provides insight into the natural history of surgically managed papillary renal cell carcinoma. Cancer. 2008 Apr 1. 112(7):1480-8. [Medline]. Klatte T, Han KR, Said JW, et al. Pathobiology and prognosis of chromophobe renal cell carcinoma. Urol Oncol. 2008 Nov-Dec. 26(6):604-9. [Medline]. Bonsib SM. T2 clear cell renal cell carcinoma is a rare entity: a study of 120 clear cell renal cell carcinomas. J Urol. 2005 Oct. 174(4 Pt 1):1199-202; discussion 1202. [Medline]. Lee CT, Katz J, Fearn PA, Russo P. Mode of presentation of renal cell carcinoma provides prognostic information. Urol Oncol. 2002 Jul-Aug. 7(4):135-40. [Medline]. Kim HL, Belldegrun AS, Freitas DG, et al. Paraneoplastic signs and symptoms of renal cell carcinoma: implications for prognosis. J Urol. 2003 Nov. 170(5):1742-6. [Medline]. Smith SJ, Bosniak MA, Megibow AJ, Hulnick DH, Horii SC, Raghavendra BN. Renal cell carcinoma: earlier discovery and increased detection. Radiology. 1989 Mar. 170(3 Pt 1):699-703. [Medline]. Volpe A, Kachura JR, Geddie WR, et al. Techniques, safety and accuracy of sampling of renal tumors by fine needle aspiration and core biopsy. J Urol. 2007 Aug. 178(2):379-86. [Medline]. Neuzillet Y, Lechevallier E, Andre M, Daniel L, Coulange C. Accuracy and clinical role of fine needle percutaneous biopsy with computerized tomography guidance of small (less than 4.0 cm) renal masses. J Urol. 2004 May. 171(5):1802-5. [Medline]. Shannon BA, Cohen RJ, de Bruto H, Davies RJ. The value of preoperative needle core biopsy for diagnosing benign lesions among small, incidentally detected renal masses. J Urol. 2008 Oct. 180(4):1257-61; discussion 1261. [Medline]. Heidenreich A, Ravery V. Preoperative imaging in renal cell cancer. World J Urol. 2004 Nov. 22(5):307-15. [Medline]. Zhang J, Lefkowitz RA, Ishill NM, et al. Solid renal cortical tumors: differentiation with CT. Radiology. 2007 Aug. 244(2):494-504. [Medline]. Hartman DS, Davis CJ Jr, Johns T, Goldman SM. 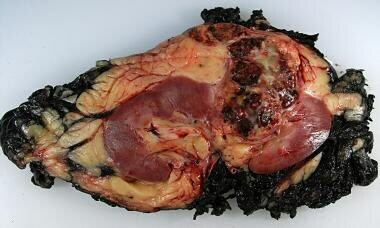 Cystic renal cell carcinoma. Urology. 1986 Aug. 28(2):145-53. [Medline]. Kim JK, Kim TK, Ahn HJ, Kim CS, Kim KR, Cho KS. Differentiation of subtypes of renal cell carcinoma on helical CT scans. AJR Am J Roentgenol. 2002 Jun. 178(6):1499-506. [Medline]. Sheir KZ, El-Azab M, Mosbah A, El-Baz M, Shaaban AA. Differentiation of renal cell carcinoma subtypes by multislice computerized tomography. J Urol. 2005 Aug. 174(2):451-5; discussion 455. [Medline]. Cribbs RK, Ishaq M, Arnold M, O'Brien J, Lamb J, Frankel WL. Renal cell carcinoma with massive osseous metaplasia and bone marrow elements. Ann Diagn Pathol. 1999 Oct. 3(5):294-9. [Medline]. Frank I, Blute ML, Cheville JC, Lohse CM, Weaver AL, Zincke H. An outcome prediction model for patients with clear cell renal cell carcinoma treated with radical nephrectomy based on tumor stage, size, grade and necrosis: the SSIGN score. J Urol. 2002 Dec. 168(6):2395-400. [Medline]. Amin MB, Amin MB, Tamboli P, et al. Prognostic impact of histologic subtyping of adult renal epithelial neoplasms: an experience of 405 cases. Am J Surg Pathol. 2002 Mar. 26(3):281-91. [Medline]. Grignon DJ, Che M. Clear cell renal cell carcinoma. Clin Lab Med. 2005 Jun. 25(2):305-16. [Medline]. Gebhard RL, Clayman RV, Prigge WF, et al. Abnormal cholesterol metabolism in renal clear cell carcinoma. J Lipid Res. 1987 Oct. 28(10):1177-84. [Medline]. Krishnan B, Truong LD. Renal epithelial neoplasms: the diagnostic implications of electron microscopic study in 55 cases. Hum Pathol. 2002 Jan. 33(1):68-79. [Medline]. Fuhrman SA, Lasky LC, Limas C. Prognostic significance of morphologic parameters in renal cell carcinoma. Am J Surg Pathol. 1982 Oct. 6(7):655-63. [Medline]. Hes O, Michal M, Sulc M, Kocova L, Hora M, Rousarova M. Glassy hyaline globules in granular cell carcinoma, chromophobe cell carcinoma, and oncocytoma of the kidney. Ann Diagn Pathol. 1998 Feb. 2(1):12-8. [Medline]. Moch H, Gasser T, Amin MB, Torhorst J, Sauter G, Mihatsch MJ. Prognostic utility of the recently recommended histologic classification and revised TNM staging system of renal cell carcinoma: a Swiss experience with 588 tumors. Cancer. 2000 Aug 1. 89(3):604-14. [Medline]. Sengupta S, Lohse CM, Leibovich BC, et al. Histologic coagulative tumor necrosis as a prognostic indicator of renal cell carcinoma aggressiveness. Cancer. 2005 Aug 1. 104(3):511-20. [Medline]. Delahunt B. Sarcomatoid renal carcinoma: the final common dedifferentiation pathway of renal epithelial malignancies. Pathology. 1999 Aug. 31(3):185-90. [Medline]. de Peralta-Venturina M, Moch H, Amin M, et al. Sarcomatoid differentiation in renal cell carcinoma: a study of 101 cases. Am J Surg Pathol. 2001 Mar. 25(3):275-84. [Medline]. Cheville JC, Lohse CM, Zincke H, et al. Sarcomatoid renal cell carcinoma: an examination of underlying histologic subtype and an analysis of associations with patient outcome. Am J Surg Pathol. 2004 Apr. 28(4):435-41. [Medline]. Gokden N, Nappi O, Swanson PE, et al. Renal cell carcinoma with rhabdoid features. Am J Surg Pathol. 2000 Oct. 24(10):1329-38. [Medline]. Kuroiwa K, Kinoshita Y, Shiratsuchi H, et al. 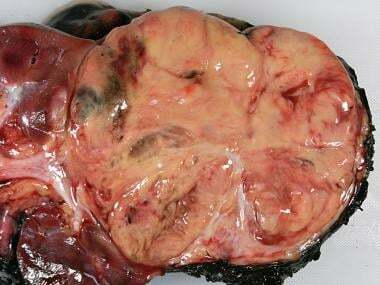 Renal cell carcinoma with rhabdoid features: an aggressive neoplasm. Histopathology. 2002 Dec. 41(6):538-48. [Medline]. Shannon B, Stan Wisniewski Z, Bentel J, Cohen RJ. Adult rhabdoid renal cell carcinoma. Arch Pathol Lab Med. 2002 Dec. 126(12):1506-10. [Medline]. Leroy X, Zini L, Buob D, Ballereau C, Villers A, Aubert S. Renal cell carcinoma with rhabdoid features: an aggressive neoplasm with overexpression of p53. Arch Pathol Lab Med. 2007 Jan. 131(1):102-6. [Medline]. Upton MP, Parker RA, Youmans A, McDermott DF, Atkins MB. Histologic predictors of renal cell carcinoma response to interleukin-2-based therapy. J Immunother. 2005 Sep-Oct. 28(5):488-95. [Medline]. Kuhn E, De Anda J, Manoni S, Netto G, Rosai J. Renal cell carcinoma associated with prominent angioleiomyoma-like proliferation: Report of 5 cases and review of the literature. Am J Surg Pathol. 2006 Nov. 30(11):1372-81. [Medline]. Shannon BA, Cohen RJ, Segal A, Baker EG, Murch AR. 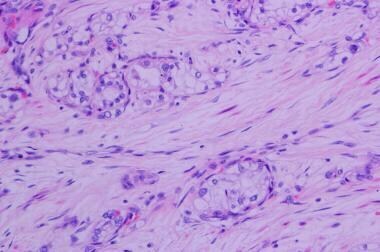 Clear cell renal cell carcinoma with smooth muscle stroma. Hum Pathol. 2009 Mar. 40(3):425-9. [Medline]. Rohan SM, Xiao Y, Liang Y, Dudas ME, Al-Ahmadie HA, Fine SW. Clear-cell papillary renal cell carcinoma: molecular and immunohistochemical analysis with emphasis on the von Hippel-Lindau gene and hypoxia-inducible factor pathway-related proteins. Mod Pathol. 2011 Sep. 24(9):1207-20. [Medline]. Tickoo SK, Lee MW, Eble JN, et al. Ultrastructural observations on mitochondria and microvesicles in renal oncocytoma, chromophobe renal cell carcinoma, and eosinophilic variant of conventional (clear cell) renal cell carcinoma. Am J Surg Pathol. 2000 Sep. 24(9):1247-56. [Medline]. Langner C, Wegscheider BJ, Ratschek M, Schips L, Zigeuner R. Keratin immunohistochemistry in renal cell carcinoma subtypes and renal oncocytomas: a systematic analysis of 233 tumors. Virchows Arch. 2004 Feb. 444(2):127-34. [Medline]. Skinnider BF, Folpe AL, Hennigar RA, et al. Distribution of cytokeratins and vimentin in adult renal neoplasms and normal renal tissue: potential utility of a cytokeratin antibody panel in the differential diagnosis of renal tumors. Am J Surg Pathol. 2005 Jun. 29(6):747-54. [Medline]. Mertz KD, Demichelis F, Sboner A, et al. Association of cytokeratin 7 and 19 expression with genomic stability and favorable prognosis in clear cell renal cell cancer. Int J Cancer. 2008 Aug 1. 123(3):569-76. [Medline]. Liu L, Qian J, Singh H, Meiers I, Zhou X, Bostwick DG. Immunohistochemical analysis of chromophobe renal cell carcinoma, renal oncocytoma, and clear cell carcinoma: an optimal and practical panel for differential diagnosis. Arch Pathol Lab Med. 2007 Aug. 131(8):1290-7. [Medline]. Fujita K, Denda K, Yamamoto M, Matsumoto T, Fujime M, Irimura T. Expression of MUC1 mucins inversely correlated with post-surgical survival of renal cell carcinoma patients. Br J Cancer. 1999 Apr. 80(1-2):301-8. [Medline]. Leroy X, Zerimech F, Zini L, et al. MUC1 expression is correlated with nuclear grade and tumor progression in pT1 renal clear cell carcinoma. Am J Clin Pathol. 2002 Jul. 118(1):47-51. [Medline]. Langner C, Ratschek M, Rehak P, Schips L, Zigeuner R. Expression of MUC1 (EMA) and E-cadherin in renal cell carcinoma: a systematic immunohistochemical analysis of 188 cases. Mod Pathol. 2004 Feb. 17(2):180-8. [Medline]. Pan CC, Chen PC, Ho DM. The diagnostic utility of MOC31, BerEP4, RCC marker and CD10 in the classification of renal cell carcinoma and renal oncocytoma: an immunohistochemical analysis of 328 cases. Histopathology. 2004 Nov. 45(5):452-9. [Medline]. Avery AK, Beckstead J, Renshaw AA, Corless CL. Use of antibodies to RCC and CD10 in the differential diagnosis of renal neoplasms. Am J Surg Pathol. 2000 Feb. 24(2):203-10. [Medline]. McGregor DK, Khurana KK, Cao C, et al. Diagnosing primary and metastatic renal cell carcinoma: the use of the monoclonal antibody 'Renal Cell Carcinoma Marker'. Am J Surg Pathol. 2001 Dec. 25(12):1485-92. [Medline]. Young AN, de Oliveira Salles PG, Lim SD, et al. Beta defensin-1, parvalbumin, and vimentin: a panel of diagnostic immunohistochemical markers for renal tumors derived from gene expression profiling studies using cDNA microarrays. Am J Surg Pathol. 2003 Feb. 27(2):199-205. [Medline]. Petit A, Castillo M, Santos M, Mellado B, Alcover JB, Mallofre C. KIT expression in chromophobe renal cell carcinoma: comparative immunohistochemical analysis of KIT expression in different renal cell neoplasms. Am J Surg Pathol. 2004 May. 28(5):676-8. [Medline]. Miliaras D, Karasavvidou F, Papanikolaou A, Sioutopoulou D. KIT expression in fetal, normal adult, and neoplastic renal tissues. J Clin Pathol. 2004 May. 57(5):463-6. [Medline]. Tretiakova MS, Sahoo S, Takahashi M, et al. Expression of alpha-methylacyl-CoA racemase in papillary renal cell carcinoma. Am J Surg Pathol. 2004 Jan. 28(1):69-76. [Medline]. Choi YD, Kim KS, Ryu S, et al. Claudin-7 is highly expressed in chromophobe renal cell carcinoma and renal oncocytoma. J Korean Med Sci. 2007 Apr. 22(2):305-10. [Medline]. Allory Y, Bazille C, Vieillefond A, et al. Profiling and classification tree applied to renal epithelial tumours. Histopathology. 2008 Jan. 52(2):158-66. [Medline]. Zhou M, Roma A, Magi-Galluzzi C. The usefulness of immunohistochemical markers in the differential diagnosis of renal neoplasms. Clin Lab Med. 2005 Jun. 25(2):247-57. [Medline]. Eichelberg C, Chun FK, Bedke J, et al. Epithelial cell adhesion molecule is an independent prognostic marker in clear cell renal carcinoma. Int J Cancer. 2013 Jun 15. 132(12):2948-55. [Medline]. Ilhan A, Neziri D, Maj M, et al. Expression of secretagogin in clear-cell renal cell carcinomas is associated with a high metastasis rate. Hum Pathol. 2011 May. 42(5):641-8. [Medline]. Wang HY, Mills SE. KIT and RCC are useful in distinguishing chromophobe renal cell carcinoma from the granular variant of clear cell renal cell carcinoma. Am J Surg Pathol. 2005 May. 29(5):640-6. [Medline]. Khoury JD, Abrahams NA, Levin HS, MacLennan GT. The utility of epithelial membrane antigen and vimentin in the diagnosis of chromophobe renal cell carcinoma. Ann Diagn Pathol. 2002 Jun. 6(3):154-8. [Medline]. Salama ME, Worsham MJ, DePeralta-Venturina M. Malignant papillary renal tumors with extensive clear cell change: a molecular analysis by microsatellite analysis and fluorescence in situ hybridization. Arch Pathol Lab Med. 2003 Sep. 127(9):1176-81. [Medline]. Fuzesi L, Gunawan B, Bergmann F, Tack S, Braun S, Jakse G. Papillary renal cell carcinoma with clear cell cytomorphology and chromosomal loss of 3p. Histopathology. 1999 Aug. 35(2):157-61. [Medline]. Gobbo S, Eble JN, Maclennan GT, et al. Renal cell carcinomas with papillary architecture and clear cell components: the utility of immunohistochemical and cytogenetical analyses in differential diagnosis. Am J Surg Pathol. 2008 Dec. 32(12):1780-6. [Medline]. Lopez-Beltran A, Scarpelli M, Montironi R, Kirkali Z. 2004 WHO classification of the renal tumors of the adults. Eur Urol. 2006 May. 49(5):798-805. [Medline]. Eble JN, Bonsib SM. Extensively cystic renal neoplasms: cystic nephroma, cystic partially differentiated nephroblastoma, multilocular cystic renal cell carcinoma, and cystic hamartoma of renal pelvis. Semin Diagn Pathol. 1998 Feb. 15(1):2-20. [Medline]. Adsay NV, Eble JN, Srigley JR, Jones EC, Grignon DJ. 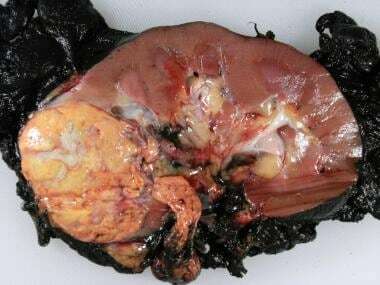 Mixed epithelial and stromal tumor of the kidney. Am J Surg Pathol. 2000 Jul. 24(7):958-70. [Medline]. Michal M, Hes O, Bisceglia M, et al. Mixed epithelial and stromal tumors of the kidney. A report of 22 cases. Virchows Arch. 2004 Oct. 445(4):359-67. [Medline]. Nikaido T, Nakano M, Kato M, Suzuki M, Ishikura H, Aizawa S. Characterization of smooth muscle components in renal angiomyolipomas: Histological and immunohistochemical comparison with renal capsular leiomyomas. Pathol Int. 2004 Jan. 54(1):1-9. [Medline]. Kovacs G. Molecular cytogenetics of renal cell tumors. Adv Cancer Res. 1993. 62:89-124. [Medline]. Gunawan B, Huber W, Holtrup M, et al. Prognostic impacts of cytogenetic findings in clear cell renal cell carcinoma: gain of 5q31-qter predicts a distinct clinical phenotype with favorable prognosis. Cancer Res. 2001 Nov 1. 61(21):7731-8. [Medline]. Hoglund M, Gisselsson D, Soller M, Hansen GB, Elfving P, Mitelman F. Dissecting karyotypic patterns in renal cell carcinoma: an analysis of the accumulated cytogenetic data. Cancer Genet Cytogenet. 2004 Aug. 153(1):1-9. [Medline]. Monzon FA, Alvarez K, Peterson L, et al. Chromosome 14q loss defines a molecular subtype of clear-cell renal cell carcinoma associated with poor prognosis. Mod Pathol. 2011 Nov. 24(11):1470-9. [Medline]. Shen C, Beroukhim R, Schumacher SE, et al. Genetic and functional studies implicate HIF1α as a 14q kidney cancer suppressor gene. Cancer Discov. 2011 Aug. 1(3):222-35. [Medline]. [Full Text]. Akhtar M, Tulbah A, Kardar AH, Ali MA. Sarcomatoid renal cell carcinoma: the chromophobe connection. Am J Surg Pathol. 1997 Oct. 21(10):1188-95. [Medline]. Dal Cin P, Sciot R, Van Poppel H, Balzarini P, Roskams T, Van den Berghe H. Chromosome changes in sarcomatoid renal carcinomas are different from those in renal cell carcinomas. Cancer Genet Cytogenet. 2002 Apr 1. 134(1):38-40. [Medline]. Green FL, Page D, Fleming ID, et al, eds. AJCC Cancer Staging Manual. 6th ed. New York: Springer; 2002. [Full Text]. Lam JS, Belldegrun AS, Pantuck AJ. Long-term outcomes of the surgical management of renal cell carcinoma. World J Urol. 2006 Aug. 24(3):255-66. [Medline]. Kunkle DA, Egleston BL, Uzzo RG. Excise, ablate or observe: the small renal mass dilemma--a meta-analysis and review. J Urol. 2008 Apr. 179(4):1227-33; discussion 1233-4. [Medline]. Costa LJ, Drabkin HA. Renal cell carcinoma: new developments in molecular biology and potential for targeted therapies. Oncologist. 2007 Dec. 12(12):1404-15. [Medline]. Cheng L, Zhang S, MacLennan GT, Lopez-Beltran A, Montironi R. Molecular and cytogenetic insights into the pathogenesis, classification, differential diagnosis, and prognosis of renal epithelial neoplasms. Hum Pathol. 2009 Jan. 40(1):10-29. [Medline]. Schultz L, Chaux A, Albadine R, et al. Immunoexpression status and prognostic value of mTOR and hypoxia-induced pathway members in primary and metastatic clear cell renal cell carcinomas. Am J Surg Pathol. 2011 Oct. 35(10):1549-56. [Medline].